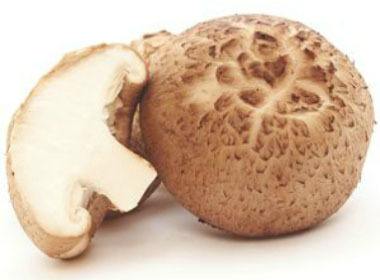 Overview: Shitake is native to a few countries in east Asia, most commonly in Japan and China. Temperature strongly affects two different aspects of this mushroom's life: mycelia growth and the fruiting body growth. The name shiitake is composed of shii, for the Japanese tree chinquapin (Castanopsis cuspidate), and take, meaning mushroom. The mushroom is found on fallen trees during the spring and autumn. Even though it grows in forests, globally, this is most recognized as a cultivated mushroom; in fact, it was first cultivated centuries ago in Japan. 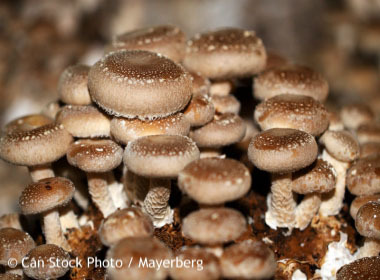 In China, this mushroom is estimated to have been cultivated for the first time between 1,000 and 1,100 AD. This is a highly sought-after medicinal mushroom. 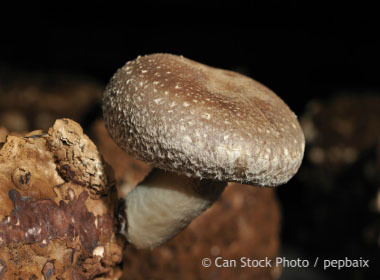 Distinguishing Features: The shitake has an umbrella-shaped cap that is tan to brown in colour. 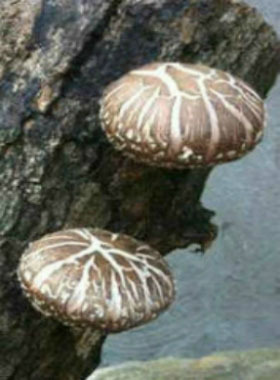 The edges of the cap roll down and inwards towards the whitish, cream-coloured gills on the underside of the cap.The stem of the shiitake is also white or cream but can turn brown as the mushroom grows larger. Caps grow anywhere from 5 to 15 cm (2 to 6”) in diametre. Height: Lentinula edodes usually grow anywhere from 5 to 8 cm (2 to 4”) tall. Habitat: Shitake grow in groups on the decaying wood of deciduous trees, particularly chinquapin, chestnut, oak, maple, beech, sweetgum, poplar, hornbeam, ironwood, and mulberry. Its natural distribution includes warm and moist climates in southeast Asia. Season: Shitake fruits in the spring and the autumn. 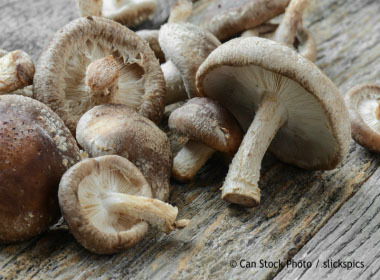 Edibility: This mushroom is the second most widely cultivated mushroom in the world. It has been a popular food source in the cuisine of Asia for thousands of years. They are a rich source of copper, selenium, iron, zinc, dietary fiber, and protein. It is also a good source of the B-complex, vitamin C and vitamin D.